Up until recently, the only trouble for Phoenix was in the accounting office. Can the Shane Doan and the Coyotes keep their run of making playoffs alive in 2012? What little Phoenix had in personality was gone with the departure of Ed Jovanovski and Ilya Bryzgalov. It won't take teams long to figure out how to stop the Coyotes, but Yandle and Doan are about the only sure bets on the team. Keith Yandle, D: The secret is finally out. The mobile Keith Yandle from Boston MA is finally on the NHL landscape for his offensive abilities and a legit first pick for your hockey pool when you’re looking for defensemen. Beware though, there may be other more gifted playmaking defensemen who had off-seasons last year and might produce higher numbers than Yandle. Still, no team will be relying on his offense more than Phoenix and Yandle. 55 points from the back end in Phoenix this season but possibly a lot more on the minus side of life. Shane Doan, RW: The veteran Phoenix captain is entering his 16th season in the league, all with the Jets turned Coyotes franchise. I’m curious to see the reception he and his team will get when they play in Winnipeg this coming season. It’s business as usual for Doan, who will get 60 points guaranteed, but not much else. He is starting to slow down, so I don’t expect full seasons out of Doaner these days. Ray Whitney, LW: Did you know the veteran Whitney is only 74 points away from 1000 career points? I’m betting on him getting them this season. Whitney could be a great late pickup. He hasn’t lost his touch, just his talent pool surrounding him. He may decide that he wants to shoulder the offensive load this season. Martin Hanzal, C: More a guy to keep your eye on than draft, the impressive 24 year old from Pisek, Czech Republic will get his fair share of minutes because he’s big, nasty and plays solid defense. He has good enough hands to win faceoffs and get bounce back goals and second assists on broken plays. Should be a better season for the big Czech. If he heats up, ride him out rather than carry injured dead weight. 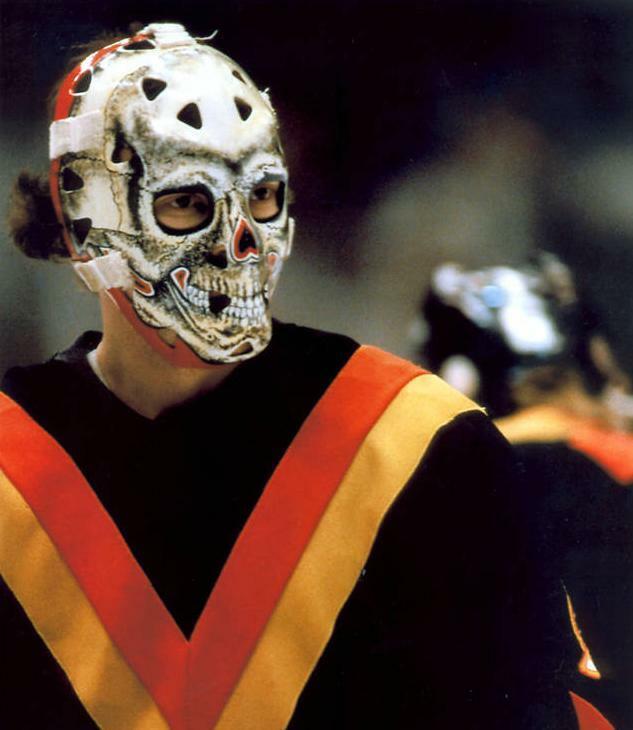 Will Pogge be in Phoenix long enough to customize his mask? Radim Vrbata, RW: It’s true, Vrbata has bounced around more than a lottery ping pong ball in his NHL days, but his best seasons have all come in Phoenix. His playoffs scoring pace of .75 points per game against Detroit in round one of 2011 is a bit of a mirage. He’s not going to give you that kind of pace, and won’t score more than 50… which is ok… but there are other players you can take. Any Phoenix Goalie: Your guess is as good as mine as to who will netmind for the ‘Yotes this coming season. Do they go with journeyman Jason LaBarbera who can give you solid backup minutes, but has never proven himself as a starter? Do they start Curtis “Mediocre” McElhinney who couldn’t crack the lousy Anaheim/Ottawa goaltending situation of 2010/2011 and is better known as “the guy who hands Mikka Kiprusoff’s his sticks”? Are they banking on Mike Smith developing into a starting goaltender after years of proving he can’t handle a full-time load? Or, are they hoping that former Canadian Junior National all-star Justin Pogge can shake whatever fog he’s been in, take the job and run with it? In any case, you’re looking at a carousel of goaltenders for Phoenix next season, so taking a Coyote netminder is a big no-no until Dave Tippet and the coaching staff sort it out. Let them do their work. Gretzky, either begging his players to score one goal or indicating how many dollars Phoenix has paid him. Tippett will have a lot less to work with in Phoenix this year, but at least they're paying him... right? soul department after losing a guy like Ed Jovanovski, and failing to retain the services of their only legitimate goalie in Ilya Bryzgalov. They have some hard workers on this team, but I sense frustration next season and nagging conversations about how the franchise is leaking millions of dollars again. Tippett will have them playing hard, but it won’t be enough for playoffs this time unless a miracle happens in net, and they suddenly get 25% more scoring out of a limp lineup. I just don’t see it in Phoenix this year. Claude Lebut Says: Ahh… no. This team is pretty ugly. What little respect they had as a franchise was gone when they couldn’t even pay Gretzky his salary. I think the team got caught with their pants down when they and everyone else thought they were moving to Winnipeg. They probably thought they just had to sit around and let the novelty of the return of the Jets carry them through this garbage they have on their roster. Their powerplay was 23rd last year and their PK was 26th. That was with Ed Jovanovski and Ilya Bryzgalov. I just don’t see those things getting better this year. When your best asset is the guy behind the bench, there’s not much you can do on the ice sometimes. My feelings? They are going to sink like a stone. Mark Twain says: What you gain at one end you lose at the other. It’s like feeding a dog on his own tail. It won’t fatten the dog.